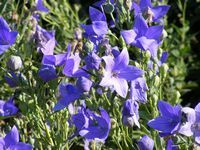 Erect, clump-forming perennial with thick roots and ovate, toothed leaves. Bears large inflated five-petaled, bell-shaped deep purple flowers in summer. Hardy - dies back in cold areas and grow out again in spring. Needs well-drained soil, full sun or light dappled shade. Condiment in Japanese food - is one of the seven herbs used to flavor Japanese sake. Roots are eaten raw in salads, added to soups as a tonic vegetable, peeled and pickled or preserved in sugar. The root of plants 2 - 3 years old, are harvested in spring or autumn, peeled and used fresh or dried. Ancient Chinese medicine that is widely used today in Chinese patent remedies. Root is also made into a cough tablet. The root contains saponins and is anthelmintic, anti-asthmatic, astringent, carminative, expectorant, haemolytic, hypoglycaemic, sedative, stomachic, tonic and vermifuge. It lowers blood sugar and cholesterol levels in the liver and inhibits the release of histamine. Internally: treats coughs with profuse phlegm, colds, bronchitis, pleurisy, pulmonary abscesses and throat infections. It is also used to treat hypertension and diabetes in Korea.